You know the feeling: you wake up with a dreadful headache, a runny nose and an insistent ache in your bones. You have caught the flu. Possibly just the man flu, but the flu nonetheless. Then there’s that dreaded moment when you realise you don’t have any painkillers at home and the thought of walking all of three blocks to get to the pharmacy… You shudder even contemplating it. Not only would it mean you’d have to move your achy bones, you’d also have to face other people while looking like a cross between Rudolph the Red Nosed Reindeer and Frankenstein’s Monster. Charming. Pinga is an easy to use app that connects Pinga partners with those in need of a service. When you put a request out, be it for painkillers, or someone to jumpstart your car, whoever is nearby will respond. 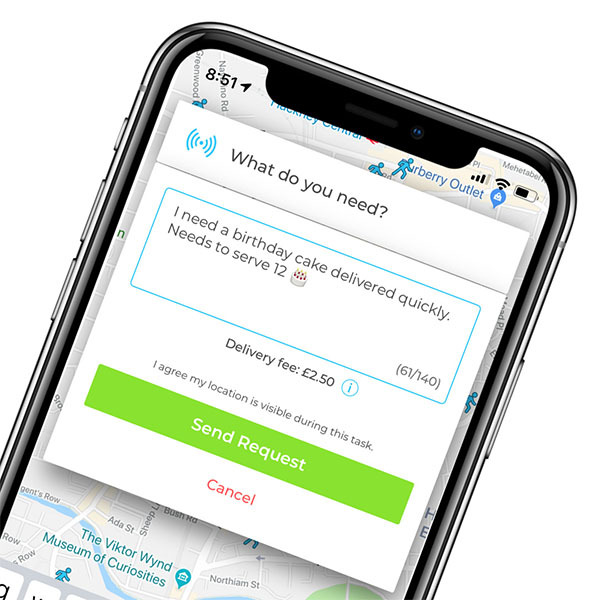 You pay for the service through the app and before you know it, your Pinga partner arrives at your doorstep to assist you, or simply to drop off whatever you needed. The great thing with Pinga, apart from boosting that community feel, is that there is no service too big, or too small. Ordering just the one bucket of ice cream from Ocado and waiting 24-hours for delivery isn’t going to cut it when you are sitting in your PJs, having just turned on your favourite Netflix show. Getting dressed again would clearly be way too demanding as well, but using Pinga is simple enough. We all know that heading to the pharmacy when we are feeling under the weather can be a pain. Not to mention: taking a sick child to the pharmacy when they’re puking all over the shop. And have you ever been stuck in the office, knowing you can’t leave, but unable to work properly because you have a looming headache? Thankfully, your local Pinga partners will be able to go to the nearest pharmacy and pick up what you need. Not only that, if you’re sick, a Pinga partner may even be able to come over and help you cook, mow your lawn, or walk your dog. Pinga is all about the community effort. Pinga is easy to use. All you have to do is download the app and send a request for what it is you need. Your local Pinga network will handle it from there. And before you know it, what you need will have arrived at your doorstep. There’s no minimum spend required, so don’t worry if you only need the one thing from your local pharmacy, or shop. Gone are the days of minimum spend and being restricted to order products from a single shop. Pinga delivers what you want, when you want it. We can help you pick up over the counter or items from your local pharmacy. Describe what you need from your Pharmacy and send your request. Pay securely within the app and receive your item from your local Pharmacy!